Thrillist and Chobani have launched a content series devoted to our shared belief that food can unite us, inspire us and even occasionally change the world. The story below celebrates the transcendence of regional snacks into something close to folklore. This belief is part of why Chobani created its Flip® varieties -- creamy, crunchy combinations of yogurt and natural mix-ins, inspired by America’s favorite desserts and snacks. Enjoy. So to pay proper homage, we dove into the stories behind 12 of the country’s favorites, spanning coast to coast. Below you’ll find origin stories, some decades old, some centuries, as well as an idea of just how dedicated fans of these foods can be. Like, “dress their kids in canned meat product costumes,” dedicated. 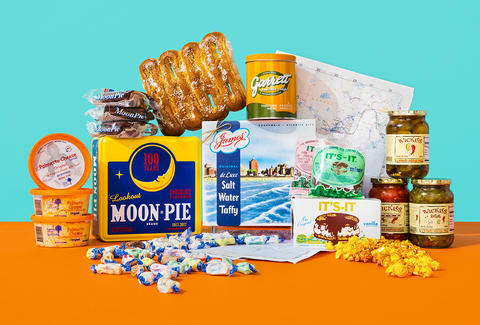 The Folklore: Ask any Southerner if they’ve ever had a Moon Pie and an RC, and they’ll either start salivating -- or tell you that they prefer their Moon Pies with a Nehi. The s’more-like sandwich that has graced soda shops, gas stations, and pantries for exactly 100 years has a literally deep origin story. In 1917, traveling Chattanooga Bakery salesman Earl Mitchell Sr. visited some Kentucky coal miners, who told him they wanted a snack “as big as the moon” and covered in chocolate. Mitchell actualized their dream and sold it for 5 cents each in company stores. The RC Cola was also just 5 cents, and a 10-cent match made in lunch break heaven was born. The Fandom: The Moon Pie may not be a main course anymore, but the devotion’s still strong. Just look at Mobile, Alabama, where they drop a 600lb Moon Pie from the RSA Trustmark Building every New Year’s Eve. The city spends more than half the year getting the stunt ready, with some RSA employees working logistics year round. To Mobile’s residents, the Moon Pie is more than just a snack, it embodies town: “It’s warm and inviting, and makes you feel good,” one RSA employee told a local news station. The icon’s also enshrined in University of Mississippi’s Encyclopedia of Southern Culture, right between mint and moonshine. Here’s how Bill Ferris, the director of Ole Miss’s Center for the Study of Southern Culture, described them on their 75th anniversary: "It was part of the ritual of being around people who cared about you and being sheltered from the elements, regardless of winter or summer, and being around people you cared about. 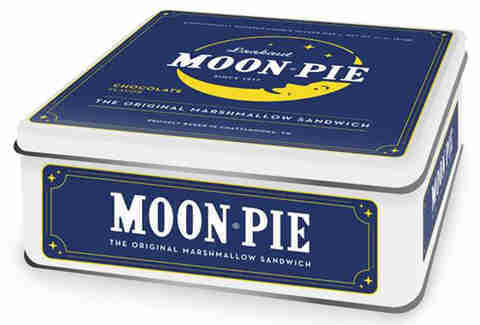 And the Moon Pie was the bread you broke during the ritual." But the last, and probably most likely, is that they are an adaption of Red Horse Bread. According to Southern food writer Robert Moss, Red Horse Bread was a side dish served in post-war South Carolina by African American fish shack operator "Romy" Govans. Red Horse was the name of a specific variety of area catfish. The Fandom: Hushpuppies have spread west, too. Lufkin, Texas has been home to the Southern Hushpuppy Championship since 1972. The Food Network “All-American Food Festival” sees around 25 teams throwing everything from creole seasoning to crab meat into their recipes as they vie for $1,000. "Yo, what's dis New York fat twisty thing doin' in a Philly park on a pedestal?" The Folklore: You don’t have to wait in an hour-long Pat’s or Geno’s line to get a true taste of Philadelphia. Just walk over to the Center City Pretzel Company for a hot treat that’s been made fresh right in the city (or just outside it, near Lancaster and York County) for more than 100 years. While some form of the pretzel has been around for 1,300 years, Julius Sturgis opened the first commercial pretzel bakery in America in 1861, right in Lititz, PA. It’s said that Sturgis adapted a recipe that a hobo gave to him in return for a warm meal. However, it’s more likely that Southern German and Swiss German immigrants, who eventually became the Pennsylvania Dutch, brought soft pretzels over as early as 1710. The Folklore: Frying cheese is a practice that goes back to 1393, when a recipe for fried muenster appeared in the French household etiquette handbook, Le Ménagier de Paris. While the very first person to perfect Wisconsin’s cheddar take on crispy cheese morsels is unknown, the Monroe Morning Optimist Club has sold them at the annual Greene County Cheese Days Festival since the ‘70s. Pro tip: the freshest curds have a characteristic squeak when you bite into them. The Fandom: Cheeseheads eat almost 7,000 pounds of fried curds annually at just ONE festival (the aforementioned Greene County Cheese Days). But that doesn’t mean everyone is on board: In 2011, when a vegan group put up a billboard right outside Lambeau Field that said: “Warning: Cheese can sack your health” Wisconsinites practically revolted. A rebuttal op-ed in The Wisconsin State Journal declared that “Cheese never killed anyone, so there” and went on to point out that a cheesehead hat had actually saved a local man’s life when he held it up to his face when his plane hit a tree and cartwheeled down the runway. So… there? The Folklore: For almost a century before the “artisan” pickle phenomenon, brothers Trey and Will Sims’ family had been making homemade pickles. The recipe consisted of semi-sweet pickles with a spicy kick that were so addicting, they rarely lasted past initial greetings at gatherings. Upon overhearing their cousin’s grandmother, Dana Ferniany, fret at a Halloween party that she couldn’t keep up with the demand from friends and family, the Sim’s brothers realized they had a potentially booming business on their hands. In 1998, they bought the recipe from Ferniany, Trey quit his job selling stocks in Atlanta, and they had Ferniany coach them on pickle prep. Their first marketing move was brilliant: they brought jars to resort towns, so that when vacationers returned home, they would start demanding the pickles at local grocery stores. 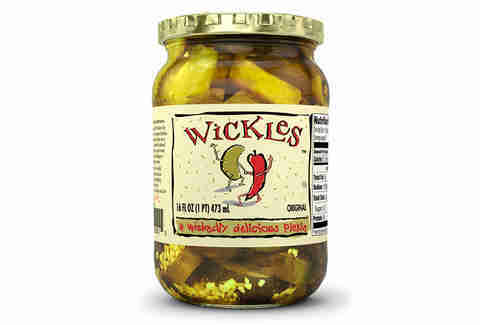 The plan worked, and the Sims brothers, along with a third partner, Andy Anderson, launched Sims Foods Inc., now the largest independent pickle producer in the country. The Folklore: So one day in 1884, the tide rolls into an Atlantic City boardwalk shop, marinating the shopkeeper’s taffy in seawater. He then gets the idea to market “saltwater taffy.” Maybe a little girl comes into the shop looking to buy taffy, and he jokes that it’s all “saltwater” taffy now. It’s all apocryphal, but two real shop owners -- David Bradley and John Ross Edmiston -- have been pinned to the story. At that time, AC was billed as a health resort, so both linked their “saltwater taffy” to ocean breeze health benefits (salt and water -- plus sugar, corn syrup and butter -- are the ingredients, but there’s no actual seawater used). Edmiston left the business a year later, and his store was taken over by John Fralinger -- a confectioner whose name still graces Jersey Shore candy shops from AC to Cape May. Decades later, Edmiston took a $500,000,000 trademark lawsuit all the way to the Supreme Court, where his claim was methodically pulled apart. The Folklore: In the mid-1800s, Central European immigrants settled into central and south-central Texas. At one point, that area had over 200 Czech-dominant communities, who started making kolaches for church breakfasts. The sweet dinner rolls were stuffed with fruits, jams, and cheeses (and later, sausages). In 1952, the Village Bakery opened in West, Texas -- it was the first business to sell kolaches to the public, according to Edible Austin. From there, dozens of other Czech bakeries popped up all over the state, most providentially in the true homes for legit Texas cuisine, rest stops, and gas stations, some open 24hrs -- allowing the thoughtful to bring a baker’s dozen home from road trips and spread the love miles beyond kolache storefronts. Sassy Henry, a woman with easily the most enviable name in snack history, would take her version of pimento cheese to Atlanta Braves tailgates, and always came home with an empty bowl. So, when she and her husband, Brian, bought the Sea View Inn in South Carolina, they started offering her cheese as an appetizer (with a few extra touches thrown in by the Sea View’s cook Vertrella Brown). It was ordered so much that they took the cheese to market in 2005, and the “Pimento Cheese with Soul” was born. The Fandom: Palmetto has taken the South by storm, most dominantly in South Carolina’s Low Country. The company didn’t do any mass marketing, but Sassy and Brian did motivate their fans to call local grocery stores and beg them to start carrying. Apparently, the push is working: that Comic Sans label can be found in 6,000 stores in 35 states. The uptick in sales came on so fast that they were nervous their manufacturing company wouldn’t keep up with demand. The kicker? The name comes from one of the brand’s first fans: he complimented Sassy on her “palmetto” cheese at one of those early gatherings. Either it was a mistake, or his mouth was full, but either way it stuck. “You know he's a local boy if he's eating Spam Musubi." The Folklore: To Hawaiians, Spam’s cherished stature dates back to World War II, when it was rationed out to soldiers stationed on the islands. Locals would also use rations to stock up on the spoil-proof product -- detached from the mainland, food was particularly scarce, so a can of Spam meant food on the table. These days, Hawaiians go through around 6,000,000 cans annually, and the most common vessel for consumption is the Spam musubi. Reminiscent of a sushi roll, a slice of Spam is typically fried with a bit of teriyaki seasoning, then placed over rice, and wrapped with a bit of nori. 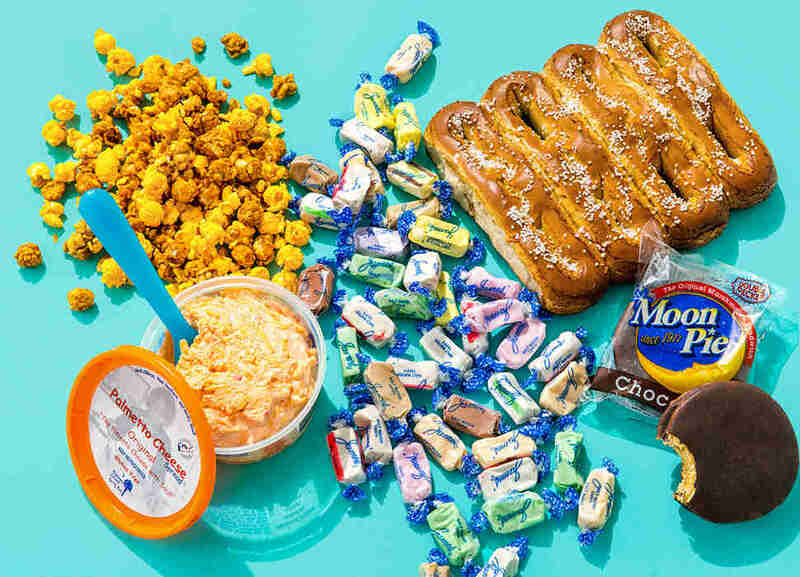 The Fandom: From Joni-Hana, the snack spread all over Hawaii, from 7-Elevens to high-end restaurants. Of the 25,000 people attending Waikiki’s annual Spam Jam festival, at least half are willing to dress their own children up like Spam musubi on the regular. When then President-Elect Obama was observed taking down two on a public golf course in ‘08, reporters for dozens of publications used it as evidence that he’d retained his Hawaiian roots. “You know he's a local boy if he's eating Spam Musubi," the course’s GM, Peter K. Yamashita, told Time magazine. The Folklore: People have been lining up in Chicago’s streets for Garrett since its first shop opened in 1949, but the mom-and-pop business turned international corporation actually began a few years before that. In 1935, the Garrett family in Wisconsin thought they would have a family cook off (pop off?) to determine who could make the best caramel popcorn recipe. One recipe stood out, and it’s the one they still use today in their CaramelCrisp flavor. They also perfected their CheeseCorn flavor, and started selling both on 10 W Madison -- with the whole family manning the shop. But their signature “Garrett Mix” wasn’t unleashed until 1977, and it’s a complete fan creation. It came about after employees started noticing customers buying two bags, one caramel, one cheese, and mixing the two together. 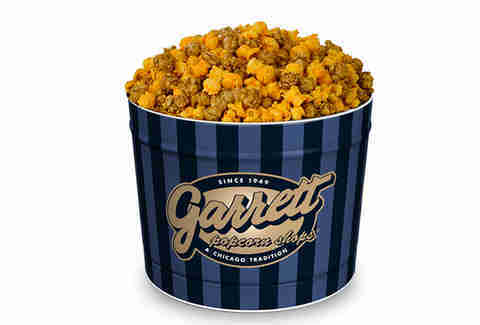 The Fandom: When you ask a Windy City expat what they miss most, the smell of a Garrett Popcorn shop (and the feel of orange cheese dust film on their hands) is normally in the top three. Kathy Griffin says she likes to get a “breakfast popcorn ball” in the morning before the lines start coming. It’s one of Oprah’s favorite foods. Obama’s staffers told the Chicago Tribune he kept a bunch of it in the White House. And, when The Tribune asked its readers to name the “8 Wonders of Chicago,” of course they nominated the 12 Garrett Popcorn shops around the city. At Chi’s 2014 Mac and Cheese Festival, the chef who took home the “Golden Noodle” made a “Garrett Mix” inspired dish: cheddar mac and cheese, layered with corn bread, salted caramel, and spicy onions. The Folklore: If you ever wondered what the American Dream tastes like, open a bag of Juanita’s Tortilla Chips. Juana Dominguez came to Hood River, Oregon with her husband and 15 children in 1953. At the time, they were one of three Mexican families in the city. The family briefly moved to California in the 1960s, where Juana found herself working in a tortilla factory. There, they churned out pricey, frozen tortillas that Juana said tasted too much like lime. So, with almost no money, the family moved back to Hood River, rented a room in the city’s Heights District, and started working to create “a good tortilla” by hand. That was in 1977. In the beginning, every two months, the family would make a 12-hour drive to Madera, California to buy sixty 50lb bags of masa -- the most they could fit in their van. Today, they make 300,000 bags of tortilla chips a year. And the masa? It’s bought by the truckload and brought back to the Hood River factory Juanita's operates out of today. Apparently, it’s contagious: Sitka, Alaska started carrying the chips in local grocery stores just a few years ago, and already the town goes through 19,000 bags a year. Sitka’s population: 8,800. The Folklore: It’s-It has been around longer than the Golden Gate Bridge, and to Bay Area natives it’s nearly as iconic. It’s-It was the realization of Playland-at-the-Beach amusement park owner George Whitney’s quest to make the perfect ice cream treat. 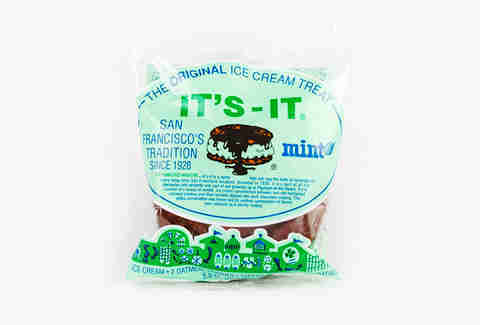 History (or close enough) has it that when he took vanilla ice cream, placed it between two oatmeal cookies, and hand dipped the sandwich in chocolate, he shouted “It’s it!” as he took a bite, instantly naming the legend. For decades, seekers would have to head to his pie shop. But the amusement park was demolished in 1972, and the It’s-It was purchased by George Marvos, who owned a small business near the original Playland site. The demand for the ice cream, however, reached a fever pitch. Marvos couldn’t keep up, so he sold to businessman Charles Shamieh. Just two years later, Shamieh started producing the It’s-It sandwiches on a mass scale. The Fandom: It’s-It spends absolutely nothing on marketing, but still manages to sell 14 million ice cream sandwiches annually. For old-timers, the snack brings them back to the smell of the ocean, sliding down the longest indoor slide at the Fun House, and eating an It’s-It at the end of the day. And those who never experienced Playland are introduced to It’s-It by the sixth grade; the company delivers their product to 85% of the public schools in Northern California. They’ve also spread all over the West Coast, added five additional flavors (including green tea and pumpkin) -- but the original vanilla is… well, It’s It.